This is Bugsy (on the right), our first foster dog of 2012 and 21st foster to date. I picked him up last Wednesday so he has been with us for a week now. Previously he was with another foster parent for a month who was a foreign exchange student, but he went back to his home country. Bugsy (previously known as Baby) is a male chihuahua/terrier mix that was surrendered to Town Lake Animal Center (now Austin Animal Center). As you can see in the picture, he is about the size of a cat and he has a slight (cute) underbite. Bugsy is about 5 years old and you can read his full bio here. Bugsy is sweet and smart. He is house broken and non destructive. He has no problem with being crated, but once he is in there, he becomes aggressive and growls because (we are guessing) he has fear issues. At first it was disheartening to see him become like this, but with some dog training help from Jennie Chen (@misohungry on Twitter), Peter and I learned to better take control and reduce the aggressive behavior. I had been wanting to foster dogs for a while but had not found an organization yet. I tried few times before but each time I was turned down because I had a dog who was not spayed – Emma my little bitty 4lb Yorkie. She was never around unfixed male dogs so I didn’t want this little thing to go through any surgery. If she were bigger, wanted to play with other dogs, or liked being outside then I probably should have, but she was a very sheltered dog. I don’t think she even knew she was a dog (she acted more like one of my cats). I know it’s probably a big no no for dog shelters to let someone with an unfixed dog foster one of their own. It goes against what they believe in so I understand why other shelters turned me down. Luckily, Austin Pets Alive! understood my situation and was able to work with me. When I went through the application process with APA! they called my references and came to my home to make sure it was suitable for the future foster dogs. Once I was listed as a dog foster, I was ready to pick a dog to love! At APA! we use Yahoo! groups to match dogs to fosters. First, APA! posts a plea message on their bulletin board for dogs who need to get out of the kill shelters around town. Then, fosters volunteer to take the dog on a first come, first served basis. Back in 2009, APA! did not have a building for any of these dogs go to, so it was up to the fosters to take in the dogs and get them off the euthanasia list. My first foster was Ella and her 8 new born puppies. 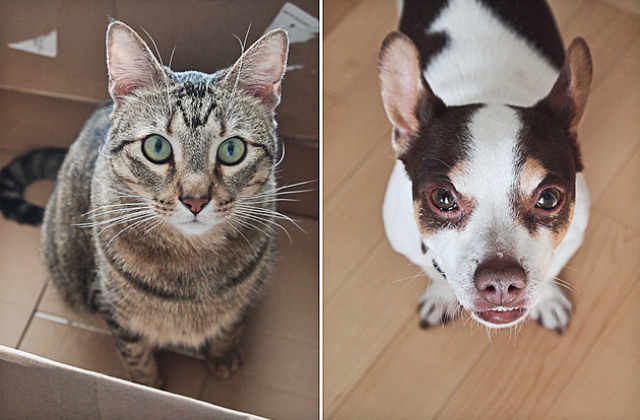 Since I was first to pick them up from the shelter (where they were on the euthanasia list), I was able to name them. The mom was named Ella. The eight puppies were named Emma Jr., Austin, Dallas, Dottie, Jack, Jill, Ava, and Houston. I had the puppies until they were about 8 – 9 weeks old and I had Ella until July. Puppies went quick. It only took about a week for them to be adopted. It took couple of months for Ella. They were probably not the best option for my first fostering experience and it was a lot of work (A lot of poop. A lot of feeding.) but I don’t regret it at all. Ella made it easier by being such a good Mom to her pups. When the puppies grew up more and could walk, they would all come running towards me. That is joy that just cannot be explained. I still miss them all and think of them.